Reigning Everest hero Redzel’s ability to adapt to all conditions and his on-pace racing style are the traits that drew Yulong Investments to secure the top sprinter for the 2018 edition. The rising six-year-old is the third horse locked in for the $13 million The Everest (1200m) run at Royal Randwick on October 13. Yulong boss Yuesheng Zheng was one of the first to support the Everest concept, outlaying the $1.8m for the first three years, and again acted swiftly to sew up his runner. “He loves the concept, he really wants to be involved in a big way in Australian racing,’’ Yulong’s chief operating officer Sam Fairgray said. “Racing is his passion and any race meeting, whether it is country or city, he gets great enjoyment out of watching his horses go around. 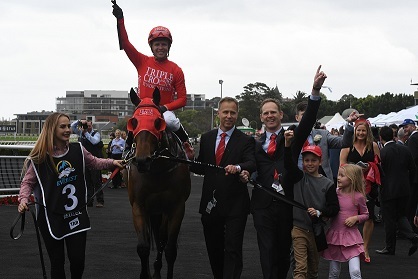 “Redzel obviously won it last year but he is so adaptable in all conditions. If it is a wet track then it’s not a problem to him. Golden Slipper winner She Will Reign raced in the Yulong slot last year but it wasn’t long after Redzel reigned supreme that Mr Zhang placed the gelding high on his wish list for 2018. “Twelve months ago in Brisbane he showed he was up to the highest level and has continued to show it,’’ Fairgray said. Triple Crown director Michael Ward said the owners were won over by Mr Zhang’s enthusiasm to partner with the Redzel team. Although securing the James Harron slot just a month out from the race last year did Redzel’s chances no harm he said having the slot out of the way now provides certainty and allows for planning. Redzel is favourite to defend his Doomben 10,000 title this Saturday, where he faces off with TAB’s Everest runner In Her Time, before being pointed squarely at The Everest. “We’ve secured the slot a lot earlier than we did last year, we’re in a different position now and it gives us the freedom to prepare from here with The Everest the main goal,’’ Ward said. With over $8.6 million in the bank, Redzel is the seventh highest prizemoney earner in Australian history and a win in the 10,000 would see him leapfrog Chautauqua into fifth and atop the list of sprinters. Ward said the owners are excited about being involved in the build up and the buzz of the race once again knowing they’ve struck it lucky with Redzel. “It’s a once in a lifetime opportunity to be racing for that type of money but to be racing for $3m more is amazing,’’ he said. Redzel is equal favourite with Trapeze Artist at $5 in TAB’s All-in market ahead of In Her Time at $7.